Pet surveillance is necessary to keep your furbabies safe at all times — and Furbo Dog Camera can help you do that easily. The best pet surveillance camera is one that lets you see your dog night and day. Furbo has both HD vision for daytime viewing and video and photo capabilities as well as night vision for after-dark surveillance. You can always see your dog clearly and know what's going on. Low lighting won't get in the way when you need to check in on your furriest loved one. No pet surveillance camera is effective unless it helps take care of your littlest family member easily with good visual confirmation. Furbo does that easily with great optics and crisp, clear picture in both regular and low lighting. Your dog communicates effectively through barking to let you know they need your help or attention. The only problem is when you're not around. How can you know there's an emergency or problem when you can't hear your dog trying to communicate? Your dog may not be able to dial a phone, but he or she can communicate with you through Furbo. 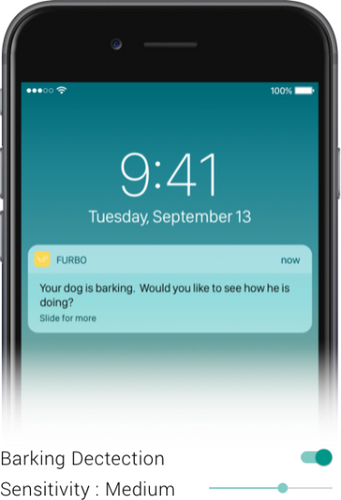 Furbo has a barking alert feature that allows you to be informed by instant notification if your dog starts barking. If your dog is making noise, you get an alert so you can respond promptly. The high-tech system filters out ambient noise to reduce the risk of false alarms. A pet surveillance camera that doesn't let you use your phone or mobile device isn't much use. When you're away from home, you want to be able to check in on your furriest family member. Furbo has an app that allows you to check on your dog and communicate with them no matter where you are. As long as you have your phone with you, you can use the app, which is compatible with both Android and Apple devices. With Furbo, your dog is always as close as your phone. The app lets you dispense treats, get barking notifications, engage in two-way communication, adjust the barking notifications, take photos and video and even post your images and videos on social media. There's no point in being able to see your dog unless you can also communicate with them. Why just monitor your furbaby? If he or she is distressed or barking, just being able to see them will not help. Furbo offers two-way communication so you can offer words to soothe and comfort. There's even a treat dispenser to ensure your dog runs to the camera, so you can see for yourself your furbaby is fine! After all, one of the best ways to communicate with a dog is through his or her stomach. Whether you want to try remote training or just want to say, “I love you,” nothing communicates as strongly with your dog as a treat! Furbo is a unique pet surveillance system because it was developed by engineers, vets and other professionals to bring you a system that works harmoniously with dog mannerisms and biology. If you're looking for a dog surveillance camera, don't settle for a system with just the basics. The canine member of your family deserves better than that! Furbo is a two-way, whole-system solution with a treat dispenser and a free app. Not only can you keep track of your furry family member 24/7 from any location, but you can communicate, too. Order Furbo today to take advantage of this intuitive system.